Quotes are an integral part of many businesses, but it isn’t always easy to keep track of them. PayGo allows you to create and send quotes through your PayGo software and convert your approved quotes to purchase orders, all in one place! You can access any open quotes through your PayGo software through your central Sales screen. To do so, click the Open Quotes button at the top of the Sales screen. Alternately, you can click the New Quote button, which will give you the option to view a list of all your open quotes. 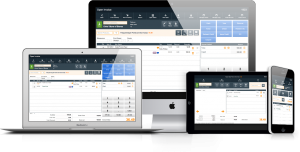 This will take you to an Invoice List screen, where you can open, view or delete all of your existing quotes. Click the New Quote on your central Sales screen. This will prompt a pop-up box asking if you would like to either List All open quotes within your software, or start a New quote. Clicking New will take you to the Quote screen. Close: This will close the Quote screen. All information you have entered will be saved automatically. Find Inventory: This will open the Inventory Search screen, where you can search for and add items from your inventory. New Inventory: This will open the Inventory Quick Add screen where you can add new inventory items to your quote. Move to Other: This button will move or copy selected items from your quote to either a new or existing quote. Return: This will open the Returns screen. Any returns entered on this screen will appear on your quote. Open Invoices: This will open the Invoice List screen. New Quote: This will open a new Quote screen. Your current Quote screen will stay open. Print/Email: This will print out the quote. Pay: This will open a payment screen. The screen will have the same payment buttons as your Sales screen and will operate in a similar fashion. Open Order: This will switch your quote to an Open Order in your PayGo software. Below the buttons, you will see the Search Customers bar, as well as the New customer button. If a customer is added to the quote, the Ship To/Bill To tabs will automatically populate with the customer’s contact information. The Freq (frequent) Buyer tab will show information about the customer’s frequent buyer status and points. In the Order Information box, you can add notes to both the Customer (these notes will be included on your printed/emailed quote) along with a space for the quote’s lead time/delivery notes, and to your Internal staff (which will not be seen by the customer). The Order Data area is where you can add information about the order. The Customer PO box is where you can enter the customer’s own purchase order ID for the quote. If you don’t know all of the information in this box, it can be entered or edited in the Open Order screen as well. The Terms box is for your set payment terms. This area is also where you’ll set the quote’s Print Output (Email, Full Page, Receipt or PDF), number of Copies to print, and the Salesperson for the quote. The Totals box is for all of your monetary totals for the quote, including quote Subtotal, any Discounts to apply to the sale, the Total Tax accrued, and any Shipping charges for the order. These will automatically populate based on the items you add to the quote, and will calculate the quote’s Total. NOTE: The default Item ID for shipping is #995. When the Shipping item is added to the quote, A pop-up box will ask you for the shipping Cost and Price, and will be automatically added to the Shipping field in the Totals box. If you’re unsure of the shipping cost, this can be added in the Order Fill screen when the quote has been changed to an Open Order. The bottom half of the screen is where you’ll add items to your quote. This works in the same way as your Sales screen: Items are added to the quote in the Item and Qty (quantity) fields, where they’re listed by Item ID and quantity (which can be changed by clicking on the number and entering in the desired quantity), Item Name, how many of the item are currently OnOrdr (on order), OnHand and OnHold, the Tax for the item, the item’s Amount price, any Discount applied, and the Extended price for the item. When all information for the quote has been entered, you can either exit out of the screen to leave it as a Quote in your software, or click the Open Order button to change your quote into an open order to fulfill in your software. NOTE: when your Quote is changed to an Open Order, the ID number will stay the same.